Ikelite has a long history of making quality housings at great prices, and we're excited for the NIkon D7100 underwater housing. This appears to be the first housing announced for the D7100. The Nikon D7100 is a great camera, and when combined with Ikelite's built-in TTL system (compatible with Ikelite strobes) and great customer service, the new housing will be a excellent choice for those looking to purchase a housing for their D7100 at a good value. Read our Nikon D7100 review for more info on the camera. 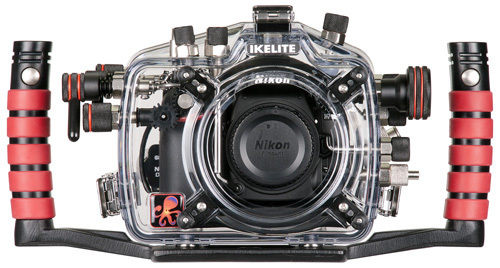 Ikelite proudly announces a full-featured, TTL enabled underwater housing for the Nikon D7100 Digital SLR camera. The Ikelite housing is built by experienced divers and underwater photographers in the USA and comes with unlimited access to Ikelite's unparalleled customer support team. Proprietary built-in TTL circuitry makes this the only housing for the Nikon D7100 that can actually improve your photos. Direct connect flash is the most reliable and efficient way to fire an external underwater strobe. The camera's built-in flash does not need to fire, providing the extended battery life and no lag between exposures. Our circuitry allows direct communication between the camera and current Ikelite DS Substrobes* for the most accurate through-the-lens (TTL) metering control of an off-camera flash. Electrical bulkhead and TTL circuitry are provided standard and included in the base purchase price. Rather than reaching out to your external strobe, exposure with a current DS Substrobe can be adjusted quickly through the back of the housing using a large dial control. TTL mode provides four 1/3 f/stop increments over or under flash compensation to fine tune exposure. Or control strobe output completely through the back of the housing using one of the 7 manual power settings provided in half-stop increments. Controls are provided for all critical camera functions. Shutter, video recording start/stop, and a large zoom control knob can all be comfortably reached without removing your hands from the handles. Comfortable rubberized grips provide quick-release attachment points for strobes and accessories. The try and handles may be removed from the housing for convenience in traveling. The complete housing is neutral or slightly negative in freshwater depending on choice of lens port. 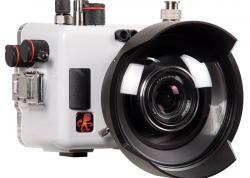 A clear view of the camera and o-ring seals facilitates easy assembly and operation. Heavy-duty polycarbonate construction is durable and corrosion-free to ensure performance in the most demanding conditions. Lens ports can be removed and replaced quickly with a simple positive locking system which provides visible assurance when the housing is assembled properly. 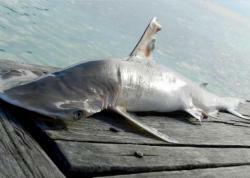 * Requires current model Ikelite DS Substrobe. Click here for strobe requirements by serial number. TTL circuitry does not operate with non-Ikelite strobes. Non-Ikelite strobes provide manual exposure only. The Ikelite housing for the Nikon D7100 is currently in production for April release. This product is available for pre-order through any Authorized Ikelite Dealer. Lens port, camera and lens not included. Ikelite housings for the Nikon D600 and Canon EOS 6D are available now. Photos and specifications for all housing models can be found at ikelite.com. 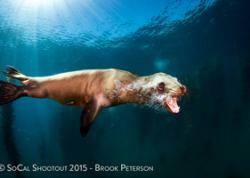 Please support the Underwater Photography Guide by purchasing your underwater photography gear like the Ikelite D7100 housing through our sister site, Bluewater Photo & Video. Click, or call them at (310) 633-5052 for expert advice!